Except as noted, prices are in U.S. dollars, bold links are to outside sites, and regular links lead to 'Book profiles on Low End Mac. "What Apple doesn't make clear in the PowerBook manual is that the battery doesn't charge if it's more than 95 per cent full. Why? To eliminate very short recharge cycles, which aren't good for the Li-ion's overall life span. If we'd have known this, we wouldn't have done the second calibration and might have a higher capacity battery." Check out 12 Steps To Better PowerBook Battery Life for more information. St. Petersburg Times staff photographer John Pendygraft is attached to the HMM 365 Marine Helicopter Squadron from New River, NC, and sends pictures from the Iraqi desert using an iBook and a NERA World Communicator satellite phone on the Inmarsat satellite system. The small, three-paneled satellite dish provides the connection to the satellite. The phone gives Pendygraft a high-speed connection to the Internet for sending photos, text, and audio. Pendygraft faces the challenge of keeping the batteries for the iBook, satellite phone, and two digital cameras charged while away from a reliable power source. QuickerTek has just announced two new antennas that boost wireless connectivity up to 50% for all PowerBook Titanium G4 users and PowerBook G3 (Pismo) portables with AirPort cards. These new antennas are shipping now for a retail price of $79.95 for the Ti Whip and $39.95 for the Ti Antenna. Wireless reception for PowerBook Titanium users in particular has been a sore spot since first implemented. Insufficient range and inconsistent network connections are common complaints. These new QuickerTek antennas work with the AirPort card by extending the antenna outside of the PowerBook case, boosting range and connection stability. Both antennas are compatible with Mac OS X and 9.x and require no drivers or software installation. A CD of relevant software is included for convenience. Users open the PowerBook, exposing the AirPort card, remove the cable connection to the internal antennas, connect the new antenna wire, thread this wire through the PC Card slot opening, and then attach the cable to the external antenna stub of the Ti Antenna, which resides in the PC Card slot opening, or to the Ti Whip antenna velcro'd to the top half of the PowerBook case. Use of either of these antennas prevents the use of the PC Card slot for other purposes. Removing the AirPort card from its original slot and placing it in the PC Card slot is not an option due to the engineering of the AirPort card. The Ti Antenna is only as wide as the PC Card slot and less than 1/2" thick, extending out from the PowerBook. This antenna is ideal for those who use their PowerBook as more of a desktop replacement. The Ti Whip antenna is more convenient and can be oriented so that reception is optimized for varying environments - ideal for those who are mobile a majority of the time. A small patch of Velcro® fixes the taller antenna to the top of the PowerBook. This provides the flexibility to reposition the antenna for optimum wireless reception. These new QuickerTek wireless antennas can be purchased from TechnoWarehouse at or QuickerTek. The Dual Link CardBus Card features two USB 2.0 Ports and one FireWire Port. Now you can have the latest in connectivity to your CardBus equipped PowerBook, easily connecting to the latest in USB 2.0 and FireWire devices such as: Hard Drives, DVD Burners, DV Camcorders, Video Capture Devices Etc. The possibilities are endless, you can now have up to 127 USB 2.0 Devices and up to 63 FireWire Devices. 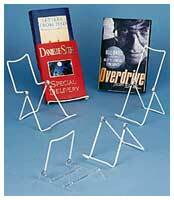 Brodart Library Supplies & Furnishings offers these heavy vinyl-coated steel stands that fold for easy storage. Packaged 12 per box. Tall display easel features a higher wire back to hold larger or taller items. 9" H x 3-1/4" W, $19. Clear Acrylic Base Easel: Sturdy clear acrylic base is machine riveted to a vinyl coated steel wire back. 4-3/4"H x 3-7/8"W x 5-1/4"D, $17.95. Display easel: An adjustable easel, great for displaying small or medium sized items. 4-1/2" H x 3-1/2" W.
Oyster introduces a new approach to portable computing by redefining the docking process. With its unique styling, ergonomic design, and intuitive cable-management system, Oyster offers a simple, easy-to-use, coherent approach to docking a laptop computer. Open your laptop, slide it into the Oyster, and connect your power and USB cables. Your screen will now be at a more usable height. You can use a full size keyboard and mouse comfortably, and the built in USB hub mean your cable management is integrated. All this and no compromise on appearance. With Oyster, the laptop user can enjoy the benefit of portability coupled with the comfort and functionality of desktop computing. Taking up only a 9" by 13" space, it's a natural fit for the home and office, as well as public settings such as schools, libraries, dormitories, and hotels. An integrated USB hub provides four ports in the rear storage area. Oyster is available in three color schemes, giving you the opportunity to select a product that best suits your workspace or homespace. Whether you choose the clean subtlety of shell white, the cool precision of oyster gray or the sleek confidence of shark black, you can be sure you are purchasing not only an impressive integrated technical solution but also a classic piece of industrial design. 2. The slot into which you slide your laptop is slightly larger than 1-1/2". It is necessary, therefore, that your computer body from base to top measures less than 1-1/2"
Oyster dock: $179-199; available from Amazon.com. Other World Computing (OWC), a leading provider of products and services for the Macintosh marketplace, today introduced two 80 gigabyte (GB) Mercury On-the-Go portable storage solutions priced at $399.97 and $419.99, respectively. The 80 GB Mercury On-the-Go portable storage solutions from OWC feature 8 MB of cache and are available with either a FireWire only interface or with both FireWire and Universal Serial Bus (USB) interfaces. The IEEE 1394/iLink-compliant FireWire interface on the 80 GB On-the-Go solutions supports both a powered (6-pin) and an unpowered (4-pin) port. Conversely, the USB interface on the combination FireWire/USB 80 GB On-the-Go external hard drive supports both USB 2.0 and 1.1. Weighing 11 ounces and measuring only 3.5" x 5.5" x 1.0", the new Mercury On-the-Go drives provide convenient and portable solutions for transferring files from one computer to another or transporting large files in secure hard drives for quick access wherever one travels. "In today's mobile environment, OWC's Mercury storage solutions are perfect for high-speed audio/video and backup needs," said Larry O'Connor, president of OWC. "Our newest On-the-Go drives come equipped with an incredible 80 GB reliable, high-performance of storage capacity, yet are small enough to fit in a shirt pocket. The ability to include both FireWire and USB support on these portable drives makes them a great solution for accessing or transferring data between various machines. And with data transfer rates of more than 40 Megabytes per second, these drives are also fast enough for even the most demanding A/V applications." "on-the-go" users needing more storage. The On-the-Go plug-and-play drives are compatible with any operating system with USB (2.0/1.x) or FireWire support, including Apple OS 8.6-9.2.2, OS X, and Windows 98SE/2000/XP. The drives have been built for portability with a shock absorption casing, and feature a cool blue activity indicator light; near silent drive operation; a 2 MB, 8 MB, or 16 MB data buffer; two FireWire ports; one USB port; and can operate without an external power source. All cables and Macintosh formatting software is also included. Pricing for OWC's On-the-Go FireWire/USB combo drives start as low as $179.99, while prices for the On-the-Go FireWire drives start as low as $165.97. Complete Mercury On-the-Go pricing and ordering information can be found online. 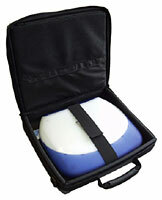 The Willow iBook Classic carry case is a lightweight, economical solution for safely transporting your clamshell iBook. The simple, effective design offers excellent protection for your iBook with room in the outer pocket for a extra battery, power supply & cord and Ethernet cord. MacMice.com has announced the purchase of DVForge, the Mac industry's premier manufacturer of luxury desk accessories and the maker of the popular DVBase iPod desk stand. In a cash transaction, MacMice's owner, Jack Campbell, has purchased all assets, inventory, and tooling for the DVForge product line from Sanders Tool & Mould Co., Inc., and has merged the new brand into the operations of MacMice Workspace Products Co.
MacMice also announces the move of the company into new, larger facilities in Hendersonville, TN, and the addition of the iArm VESA compliant mounting arm for Apple Cinema Displays to its line of ErgoMac brand ergonomic work space products. Further details on today's announcements and product additions are available now on the MacMice.com website. For more on Jack Campbell and his business history, see Jack Campbell at It Again on AppleCrap.com (site no longer exists) and the MacTable.com reader report on MacInTouch. For more deals on current or recently discontinued models, see our Week's Best PowerBook G4 Deals and Week's Best iBook Deals.